Fan flower hales from Australia and is usually sold and treated as an annual in the Pacific Northwest. Common names abound: Fairy Fan Flower; Common Fan Flower, Escabola; Blue Wonder (clearly an epithet based on this plant’s dependable, long lived and persistent blooms). 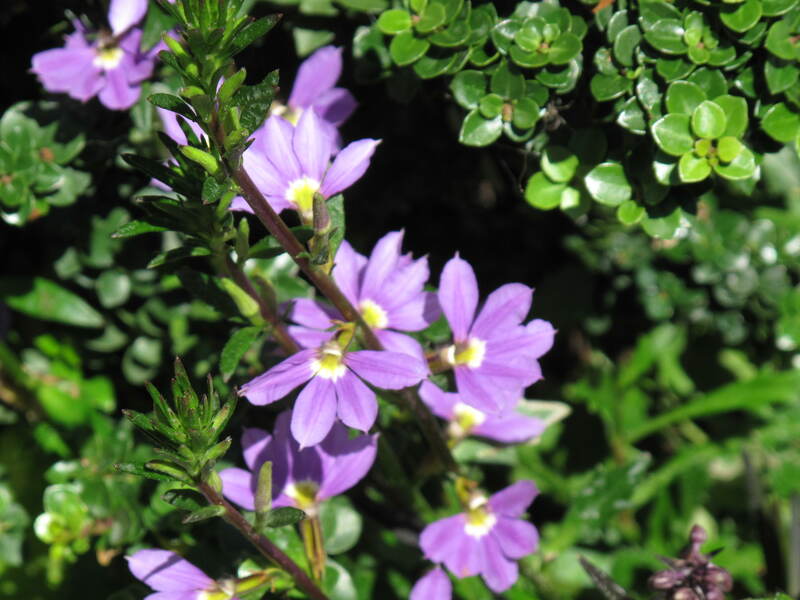 In its native Australia, fan flower is a sprawling evergreen perennial with ascending, slightly arching or procumbent (trailing) stems. It thrives in hot, humid climates where it produces a non-stop bloom of dark blue fan-shaped flowers in the leaf axils throughout summer to first frost. As the stem elongates new flowers open, but the remarkably long-lived flowers lower down on the stem remain vibrant. I’m growing mine in a large pot with the dwarf conifer Ilex crenata ‘Dwarf Pagoda’ as the centerpiece. The stems of my Fan Flower seem to arch more than trail, though some of that habit may be due to the support of the Ilex. It may take some searching local nurseries to turn up a plant. I’m not sure why, but most plant buyers don’t seem to have it on their radar. It’s best to look when annuals first arrive in the nurseries. I’ll be taking cuttings this fall and will also try to winter over the “Mama Plant,” either in my “cold” greenhouse or simply dragging into the garage during prolonged frosts. Conventional wisdom says it’s hardy to around 30° but that’s clearly in the ground and not in a pot. (Indeed, those cold hardy numbers on the plant tags aren’t referring to potted plants, nor are they necessarily accurate for plants in the ground, rather they are notorious for stretching credulity in favor of sales). 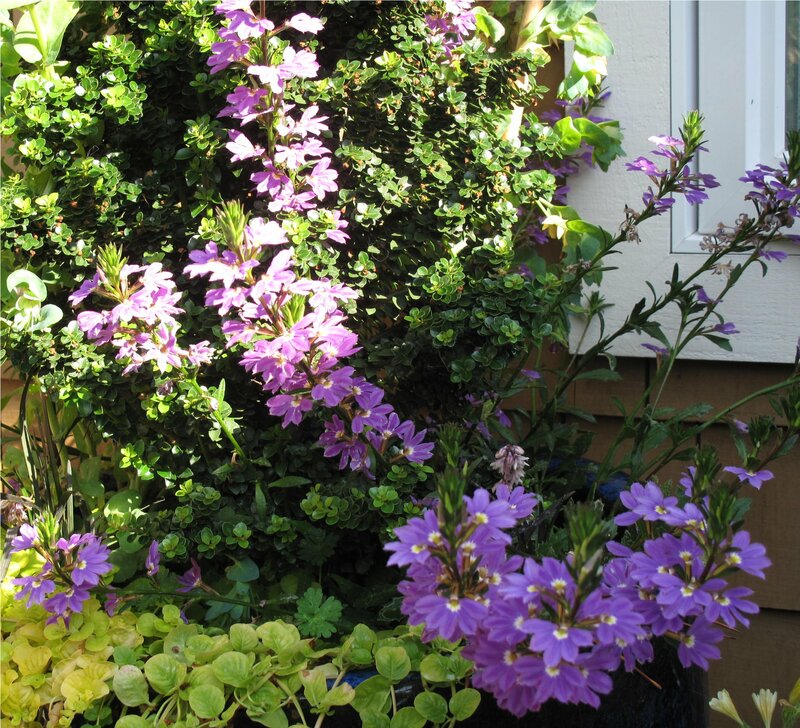 This entry was posted in Plant Picks and tagged Escabola, Fairy Fan Flower, Fan Flower, Ilex crenata Dwarf Pagoda, Scaevola aemula by Bart Arenson. Bookmark the permalink.